Known collectively as Above & Beyond, Jono Grant, Tony McGuinness and Paavo Siljamäki make up one of the world’s most successful dance acts, with recent artist album “Common Ground” entering the Billboard 200 at number three. In 2016 the Grammy-nominated trio left the electronic music world behind. Above & Beyond Acoustic: Giving Up The Day Job follows the group’s unlikely journey from the DJ booth to the Hollywood Bowl, from the initial re-imagining of songs at Abbey Road Studios, through to their presentation at iconic global venues such as London’s Royal Albert Hall, the Sydney Opera House and finally the Hollywood Bowl. With a travelling party of 17 musicians plus a 34-piece orchestra in LA, the new film is an intimate, behind-the-scenes look at one of the world’s biggest dance acts as they risk it all to go acoustic. 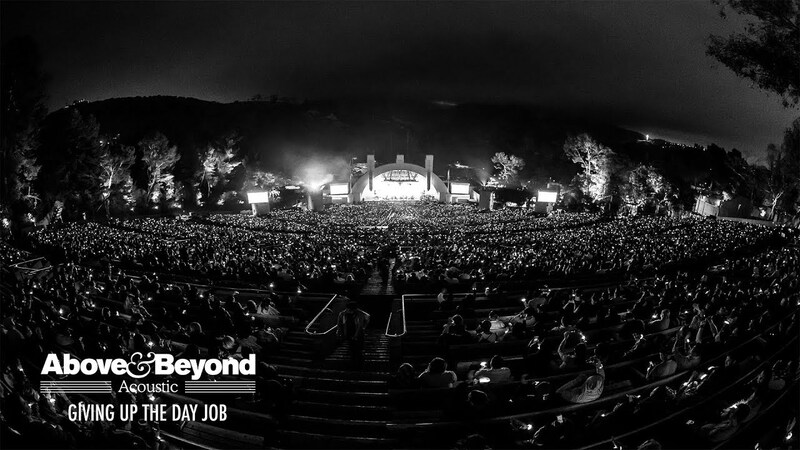 Above & Beyond Acoustic: Giving Up the Day Job was directed by award-winning directors Paul Dugdale and Myles Desenberg. Paul Dugdale with Scheme Engine (Ed Sheeran: Jumpers For Goalposts, The Rolling Stones Olé, Olé, Olé! : A Trip Across Latin America) directed the live concert at The Hollywood Bowl, and Myles Desenberg of BAFTA-nominated production company Archer’s Mark, directed the tour documentary.